Lords Mobile: Ways to Earn Gems Without Paying! In lords Mobile, you can use gems to buy a lot of special things, including all kind of resources, Revival Fruit, Royale Pass and more. But here is a rule of thumb: do not buy anything with Gems that can be bought with Guild Coins. You should save up 10,000 gems first before spending anything. Who doesn't love free Gems? There are several ways to earn free Gems in Lords Mobile. This will be our biggest source of free gems. The Treasure Trove is a bank which you unlock at Castle level 17 when you clear the last skirmish mission. 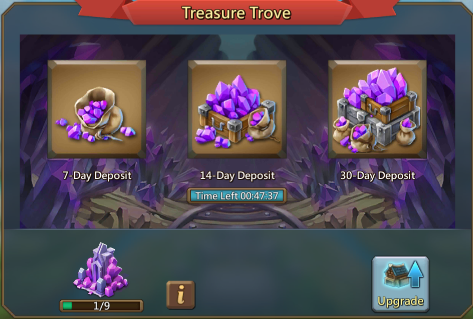 The Treasure Trove lets you deposit Gems to earn more over time. Deposit more gems for higher returns. You can upgrade it to increase the max deposit and interest rate. With a maxed out Treasure Trove you will receive 21,000 free gems every 30 days! When the servers are down for maintenance you will receive free gems! 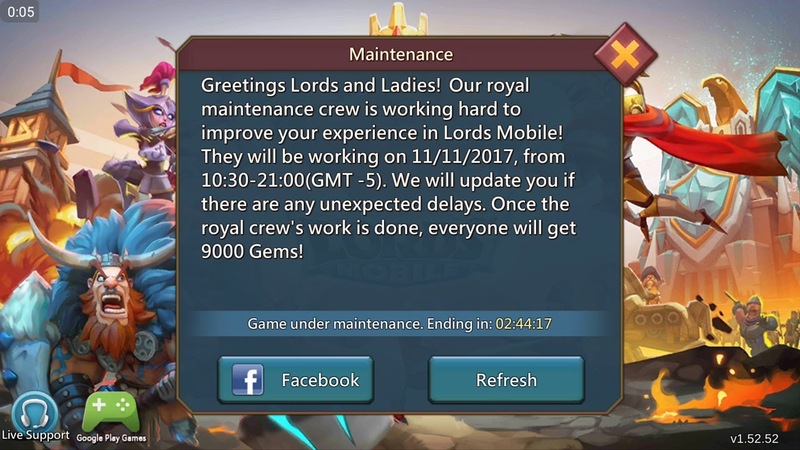 When Lords Mobile extends the maintenance you will receive even more gems! 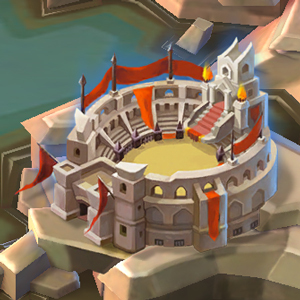 Every 3 hours, Colosseum will award players free gems based on the player's rank. If you want to stay in the top 5000, the main hero for Colosseum that you need to unlock is Rose Knight (Rose) – Tank, Heal, Protect and Stun. You need to unlock her as soon as you can (normally around level 55-57). Occasionally there will be some in-game events. Events like Guild Fest, the rewards will depend on how much points the whole guild makes. During some special event, you will have the chance to hunt down rarely monster – Gem Gremlins, 50 gems even 500 gems waiting to be claimed. It’s always a good idea to check the in-game news to see if there's an event going on. 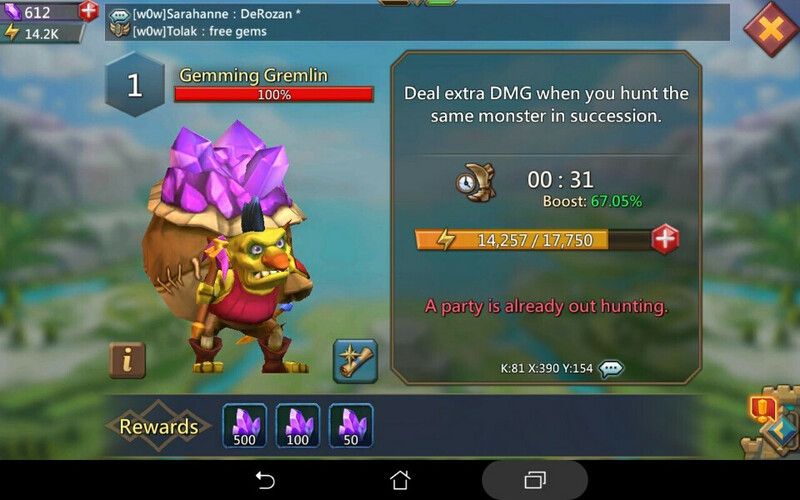 When you hunt monsters on the world map, there’s a chance you will get Gems as a reward. The amount of damage you do to a monster does NOT affect the reward. It’s random. By the way, it's a good way to get rare items and precious resources. 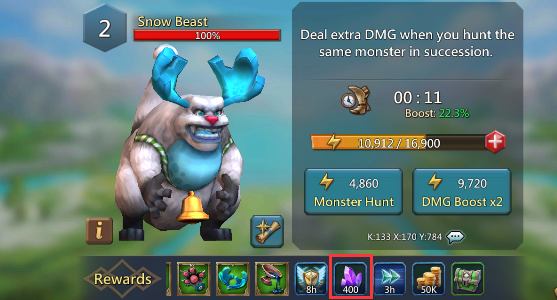 Here is a guide about Best Heroes Composition for Hunt Monster, please check. 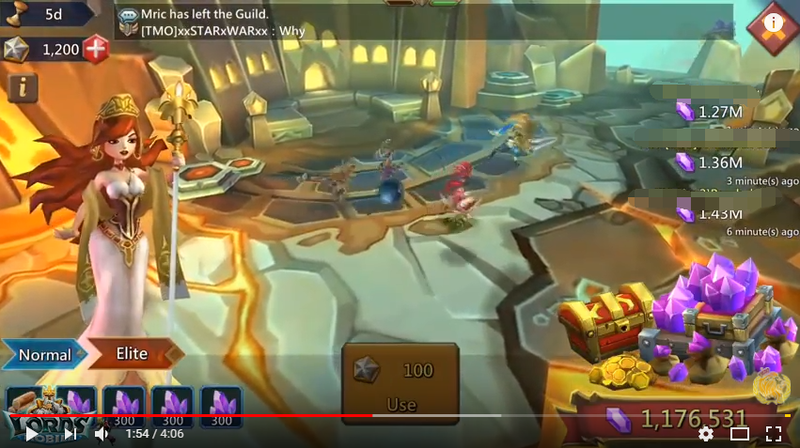 Whenever you or your guild members kill a monster on the world map or spend money in the game there will be a Guild Gift. 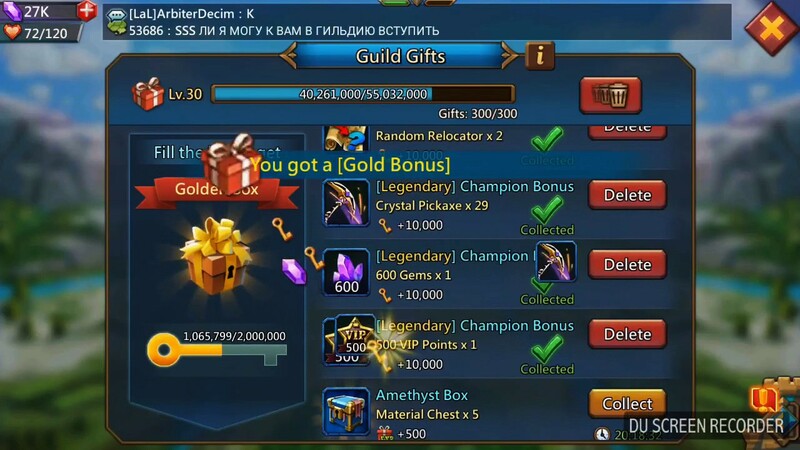 When you open the Guild Gift, you will stand a chance to gain some gems! 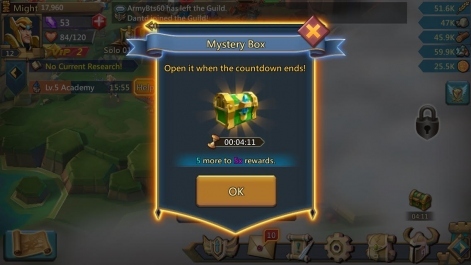 You can open the Mystery Box when the countdown ends. It contains in-game gifts and sometimes you will receive free Gems. The labyrinth is unlocked by completing Skirmish 8. You can use Holy Star to kill the monsters. Rewards are mostly resources after you defeated the Boss. Sometimes, however, a Gem Gremlin appears instead, where the prize for hitting them is 300 to 500 gems. There still have a lot of ways to earn free gems, if you have any advice about this, please kindly comment below. Next Next post: Lords Mobile: New Comic: Carol’s Plight!